Stylish cutlery is key to having an attractive, memorable dinner, and it's hard to get any more stylish than this cleaver by Hammer Stahl. The blade is crafted from the highest quality German stainless steel with razor sharp edges that are precisely measured by laser for a world-class cutting edge. The handle is made of quality Pakkawood, which not only looks great, but is lightweight and durable as well and is designed for a comfortable, confident grip. The color and grain patterns in the wood give the handle a very natural beauty and add personality to the table. 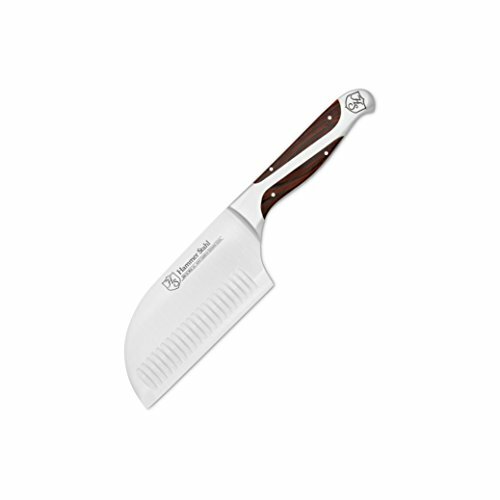 This cleaver is well-balanced with a beveled edge that allows for ease of chopping through vegetables or other hard materials with a flat blade that is also handy for cleanup. This particular knife is designed to be semi flexible, which decreases the likelihood of cracking. The blade is backed by a lifetime warranty as part of Hammer Stahl's commitment to quality cutlery. If you have any questions about this product by Hammer Stahl, contact us by completing and submitting the form below. If you are looking for a specif part number, please include it with your message.